Under the Sarbanes-Oxley Act, non-U.S. public accounting firms that audit or play a substantial role in the audit of U.S. issuers are subject to oversight by the PCAOB. Currently, over 900 non-U.S. audit firms from more than 85 countries have registered with the PCAOB. Under the Act and the Board's rules, non-U.S. registered firms are subject to PCAOB inspections in the same manner as U.S. firms. PricewaterhouseCoopers Malaysia is registered with the PCAOB Under the Sarbanes-Oxley Act, non-U.S. public accounting firms that audit or play a substantial role in the audit of U.S. issuers are subject to oversight by the PCAOB. Currently, over 900 non-U.S. audit firms from more than 85 countries have registered with the PCAOB. Under the Act and the Board's rules, non-U.S. registered firms are subject to PCAOB inspections in the same manner as U.S. firms. PricewaterhouseCoopers Malaysia is registered with the PCAOB. We continue from Part 1, where we ended with the fact that PricewaterhouseCoopers LLP and its Office of General Counsel were made aware of the fraud allegations against PwC Malaysia back in 2003, and that they did nothing about it. But what happened in Malaysia is an interesting sleight of hand, where a company called PricewaterhouseCoopers Consulting (East Asia) Sdn Bhd, was renamed as PwC Consulting Malaysia Sdn Bhd (289801-A) on 20-11-2001, to be sold off to IBM Corp as the 'legitimate' Consulting arm of PwC in Malaysia. This was done to defraud the creditors of PricewaterhouseCoopers Consulting Sdn Bhd (464379-U), as there was no way to allow IBM Corp to acquire this company without disclosing the hundreds of millions of Ringgit worth of contingent liabilities PricewaterhouseCoopers Consulting Sdn Bhd (464379-U) was hiding. Chin Kwai Fatt and Johan Raslan, together with their co-conspirators also use a tainted Auditor to audit the books of PricewaterhouseCoopers Consulting Sdn Bhd (464379-U), to keep the contingent liabilities out of sight. Chin Kwai Fatt and Johan Raslan, of PricewaterhouseCoopers Malaysia, who remain silent to this day. Neither denying nor answering the many allegations made against them. 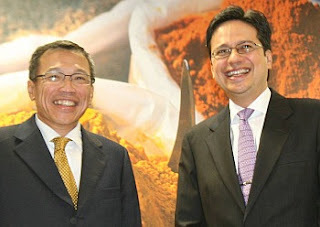 Not only that, this same tainted auditor was also the liquidator for the renamed PwC Consulting Malaysia Sdn Bhd (289801-A), when it was disposed off to IBM Corp.
To add insult to injury, Chin Kwai Fatt and Co, also masterminded the appointment of 'Sham Directors' into PwC Consulting Malaysia Sdn Bhd (298801-A), the appointment of persons who have never been a part of the PwC Consulting business in Malaysia, to facilitate the sale to IBM Corp.
Mr Paul Boorman, the Global Leader for Operations in PwC, who has not answered on the behalf of Chin and Co.
PricewaterhouseCoopers LLP, and the other global offices' have yet to answer how they can allow the continued audits of IBM in Malaysia and IBM worldwide, when technically the acquisition by IBM Corp of PwC's Consulting Arm in 2002 is still not complete. The silence of PwC despite the fraud allegations against Chin Kwai Fatt, Johan Raslan and PricewaterhouseCoopers in Malaysia, and the fact that PricewaterhouseCoopers has not kept to the terms they themselves made to the SEC and the EEC amongst others, makes one wonder what what else needs to be said before they will break their silence.